Sat., Aug. 25, 2018, 8:57 a.m.
BEIJING – At least 19 people were killed in a fire at a resort hotel in China’s northeastern city of Harbin early Saturday, the local government said. The fire broke out at the four-story Beilong Hot Spring Hotel in Harbin’s Sun Island recreation area at 4:36 a.m. and was extinguished at 7:50 a.m. by a force of 105 firefighters with 30 firetrucks, state television reported. Firefighters found 16 people dead and three more died at a hospital, the city government and provincial fire department said on their social media accounts. It said 18 people were injured and a total of 70 evacuated. The cause was under investigation, the Xinhua News Agency said. Harbin, with about 5 million people, is the second-largest city in China’s northeast, after Shenyang. It is known for the Russian architecture of its inner city and as the site of a winter festival with sculptures made of ice blocks cut from the Songhua River. The ruling Communist Party has tried to improve fire safety following deadly blazes at hotels, shopping malls and apartment buildings. But the country still suffers major fires. 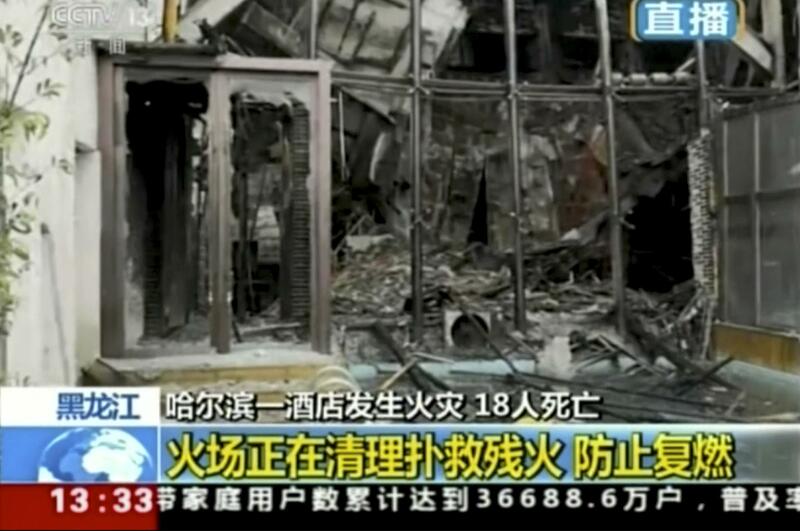 In November, a fire blamed on faulty wiring at a Beijing apartment building killed 19 people. A 2010 blaze at a Shanghai apartment tower killed at least 58 people. Authorities blamed sparks from a welder’s torch. Published: Aug. 25, 2018, 8:57 a.m.